After Thanksgiving at Borrego Springs, the group moved on to Indio. While there, we went to the Tamale Festival. It was great, with lots of different flavors available. I had blueberry. After Indio, 4 of us decided to go to see Joshua Tree National Park. On our first day, we drove through the park. Near the southern Visitor's Center, we visited this oasis. And some unusual rock formations. On our second day there, John, Judy and I went on a couple hikes. The first was my favorite, to Wall Street Mill. It starts out with a stroll through the Joshua Trees. But there are side attractions to see, starting out with the ruins of this old pink building. And - wait for it - RUSTY STUFF! We made it to the mill! It was a gold processing mill that operated from the Depression in the 1930s until 1966. We also did the Barker Dam loop. First up were the "Disney Petroglyphs," so named because a movie company painted over them for a movie. So I guess they became pictographs, instead of petroglyphs. Barker Dam was built by cowboys to water their cattle. No water when we were there. Judy and I at the dam. 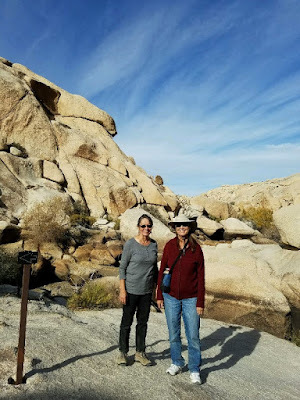 For Thanksgiving, I met up with the WINs in Borrego Springs. This is the 20th year that they have had their Thanksgiving celebration here. Thanksgiving was nice and warm, unlike some of the years we've been here. There was enough food for Thanksgiving, leftovers on Friday, and soup on Saturday. One day we went on a 4-wheel drive trip through Split Mountain Canyon. There were some unique geological features along the way. But the caves were really interesting. And then on Sunday, Corrie, Brian and my grandkids, Mara and Jonathan, came to visit and look at the metal sculptures in the area. They had been here 3 years ago, and wanted to see several of them again, including the largest, the giant Serpent. It's back end is all the way across the road. Mara kept Willy's Jeep from running over poor Jonathan. But this is the one they wanted to see the most - they wanted to dance with the Velociraptors! Do you think they take after their Grandma? After I got back from visiting my father and my granddaughter (and her parents), I headed over to my favorite event of the year, the WIN Dance Rally. Where we honored our many veterans. Before the Patriotic Dance, we had a Talent/No Talent Show. I was definitely in the latter, but I participated with my new Baritone Ukulele. There were various skits in the show, including an interview with Dr. Mal Practice. But the best part of the Dance Rally? It was held at the Fountain of Youth Spa and RV Resort, north of Niland, CA. The pools and hot tubs were great. My favorite was the Mineral Hot Tub. We're planning to have the Dance Rally here next year too, and you don't have to be a WIN to attend. And if you've never been to Fountain of Youth before, they'll give you a great deal. And the Super Moon was out while we were there. One day, we went on a rather strenuous hike on the Ladder Canyon Trail. After a mis-start, where we went up, then had to go down again, we did pretty well. There are three ladders to go up. A group photo on the way up. We made it down to the wash, which was the way out. Unique geological features along the way. The whole loop is 5.3 miles, a little longer than I usually do, but it was worth it. One more ladder down, and we were out. A great hike! Just 10 days after getting back from Ecuador, I went back East to visit my father and my granddaughter. I flew out of Phoenix and saw Roosevelt Lake from the air. Ever since her first post when she was just a few hours old (here), my granddaughter has done posts on the blog. So the rest of this post is hers. Hi! I don't get to see my grandma very often, but I knew we belonged together when she wore her Minnie Mouse shirt when she came to see me. But Great-Grandpa was coming down to Great Falls, MD with his camera club, so we went over to meet up with him. Mommy took a picture of the 4 generations. But the boat is undergoing a renovation. There was even a big turtle down in the locks. We walked over to see the Great Falls of the Potomac. There wasn't very much fall color left, but the falls were very pretty. I can't believe people actually kayak down them. Daddy was trying to get a picture of me and Mommy, but I was posing for Grandma instead. 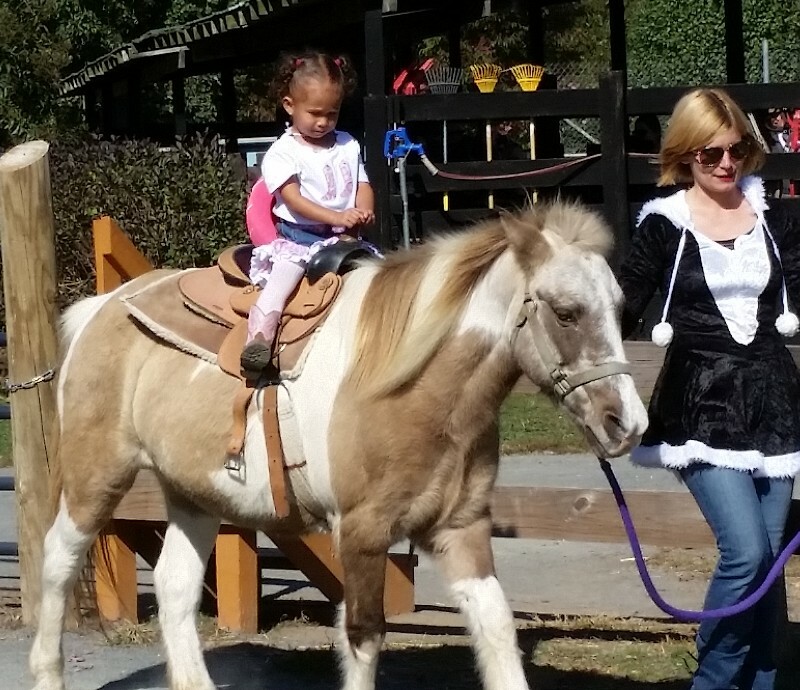 Halloween was coming up, so we went to a couple fall festivals while Grandma was here. I got to go horseback riding in my very-appropriate cowgirl costume. 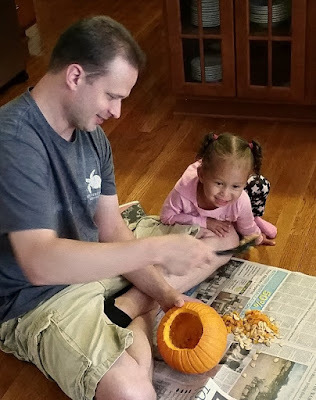 Daddy taught me how to carve a pumpkin. 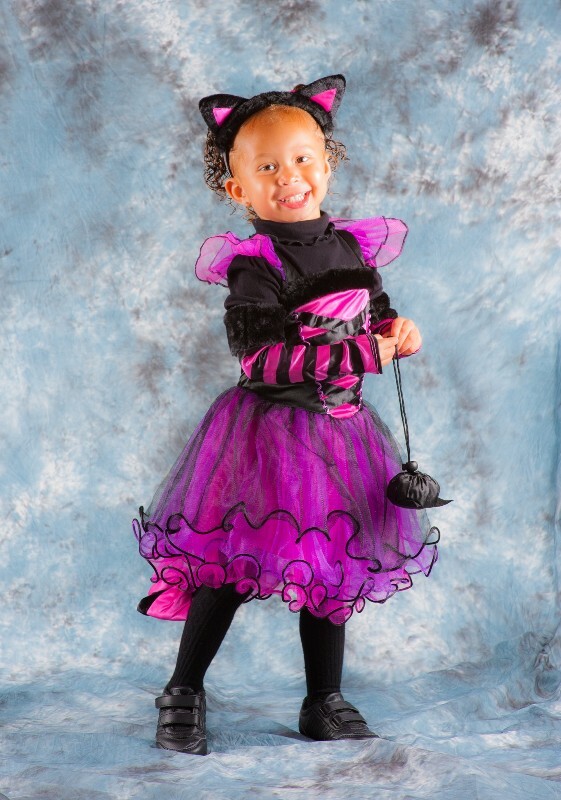 It was off to go trick-or-treating! Nothing scared me, because I got candy from even the scariest people! All too soon, it was time for Grandma to fly back to Phoenix, following the setting sun.